I’ve been a busy little bee so far this year! I’ve been working on these for awhile now and I’m so happy to release them into the wild this evening! Introducing my NEW artgoodies zippered pouches! Now you can take your artgoodies on the go! These versatile zippered pouches are handmade with exclusive artgoodies designer twill fabric designed by me! Plus the sturdy liner adds a little extra protection for whatever you might need on the go! Each pouch measures about 4” x 8”. Perfect for use as a: cosmetic case, pencil case, clutch wallet, etc! 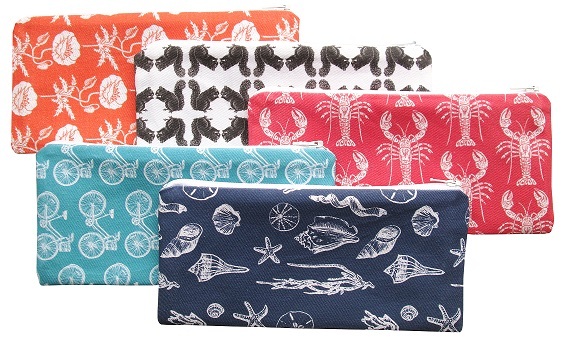 Available in: poppy, squirrel, lobster, bike, and shells! Click here to buy! Color of the Month Red! May 2014 color of the month. 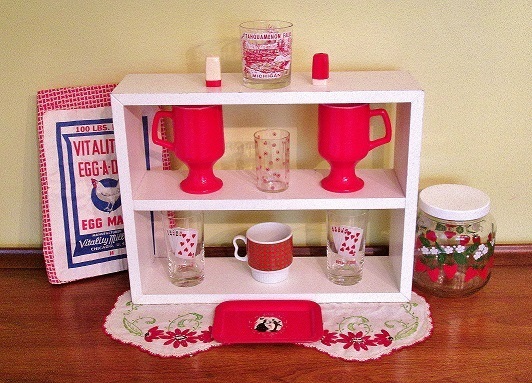 I’ve been gathering up some red vintage pieces in preparation for this setting! Fave items: feedsack with label! Gorgeous! Card glasses, strawberry jar, embroidered doilies, circle swanky swig, little tray, salt and peppers, mug, and souvenir glass. 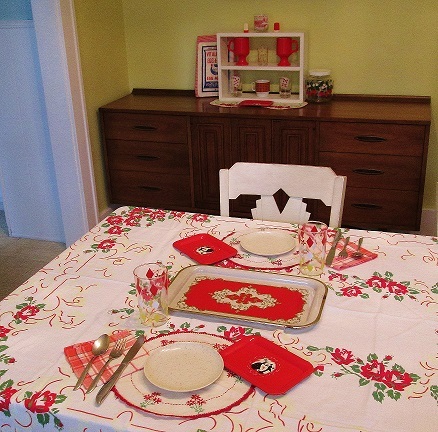 Fave items: vintage tablecloth, red and gold tray, diamond glasses, little trays, new plaid napkins-my collection is exploding out of the box! Speckled melmac atop embroidered circle linens.